Zee from Notes from the North is hosting a Nordic Book Challenge for next year and I will be joining in to put some more pressure on myself to read books I already own. The challenge is simple enough: during 2011 read the number of books for you chosen level. The books must either be by any author born in a Nordic country (Denmark, Finland, Iceland, Norway and/or Sweden) or set in a Nordic country. There are several levels of the challenge but I think I will go for the Odin level which requires reading 11-20 books. I have 13 books in my TBR pile that would count as Nordic so all I have to do is read them right? 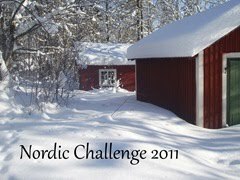 This entry was posted in Nordic Challenge 2011. Bookmark the permalink. LOL Bibliophile – anything that takes me away from the summer heat is a bonus. Looks like a great list. I’ve read some of these, and am now reading Nesser’s “A Mind’s Eye.” Interesting how we all go back to Nordic crime fiction; it usually doesn’t disappoint. Will be glad to read your reviews. I’m looking forward to your reviews Bernadette. I always learn something from them. I hope the English translation of “The Suitcase Boy” will be published in 2011 so I can recommend a good Danish thriller for this challenge. Welcome to the challenge! I look forward to hearing your thoughts on the different books!